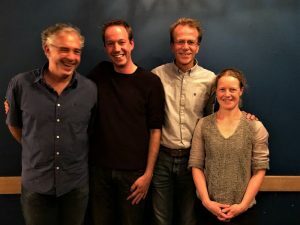 From left to right: Joost van der Ploeg, Jelmer Reininga, Ronald Boontje Suzanne Broekhuizen. On October 5th a team of three pediatricians, Ronald Boontje, Jelmer Reininga and Suzanne Broekhuizen and one ambulance nurse, Joost van der Ploeg will travel to Tanzania. They will train medical staff of two hospitals (Mvumi and Turiani) in Newborn Life Support (NLS). The training aims to provide detailed knowledge and practical instructions in the resuscitation of babies during the first 10 to 20 minutes after birth. The Dutch medical doctors will be joined by a Tanzanian gynecologist who in the near future will start to give on the job training in various dispensaries and healthcenters in Tanzania. Preparations for the training mission are in full swing. Arrangements with the hospitals have been made about the number of participants, transport of the team and accommodation. In The Netherlands materials, which will be needed during the training, are being ordered. One new reanimation doll will be bought for the Tanzanian gynecologist to be used when he starts giving the on the job training. The team wil be staying in Tanzania for one week.